Clark County property records indicate the Marriott Renaissance hotel on Paradise Road has been sold for $111 million. Calls to the seller, Jackson-Shaw Paradise LV II LP in Aurora, Colo., were not returned. The buyer, WS RLV LLC, is an out-of-state firm working through a registered agent in Las Vegas. Clark County property records indicate the Marriott Renaissance hotel on Paradise Road has been sold for $111 million. Calls to the seller, Jackson-Shaw Paradise LV II LP in Aurora, Colo., were not returned. The buyer, WS RLV LLC, is an out-of-state firm working through a registered agent in Las Vegas. The 14-story hotel is adjacent to the Convention Center at 3400 Paradise Road. It has 518 guest rooms and 22,000 square feet of meeting space. 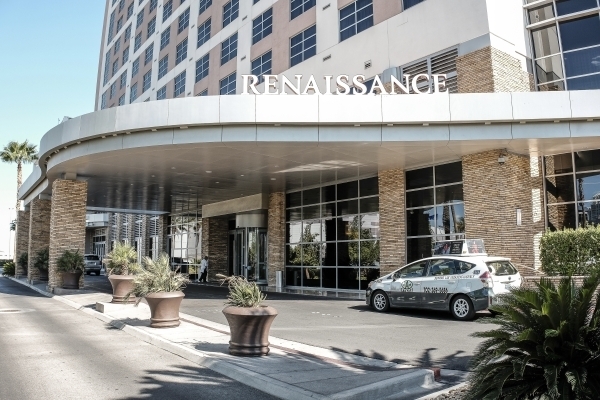 In June, the Clark County Commission approved a reassignment of its porte-cochere agreement with the hotel to WS RLV. Institutional fund manager BKM Capital Partners said it has completed 29 leases in three of its Las Vegas properties. “The Las Vegas industrial market has leapt into action, and our investors are reaping the benefits,” says Matthew Stephenson, director of asset management for BKM Capital Partners. Ten of the leases are at the Wind River Industrial Complex. BKM acquired the 137,715-square-foot property in October, and the leases cover 61,175 square feet. The building is 95 percent leased, up from 71 percent at acquisition. Sixteen of the leases are at Patrick Commerce Center, which BKM acquired in May 2014. Those leases cover 119,172 square feet. Occupancy has increased from 55 percent to 86 percent. BKM said it paid $68 per square foot for the 223,009-square-foot building and sets today’s value at more than $100 per square foot. The remaining leases are in Cheyenne Technology Center, a six-building, 172,329-square-foot multitenant/industrial park. BKM has completed interior renovations since its acquisition in November. The center is 84 percent occupied. BKM is based in Irvine, Calif.
• C.Y. Tom has purchased a 17,390-square-foot office building at 1909 S. Jones Blvd. for $1.3 million. Eric Larkin of NAI Vegas represented the buyer. The seller was Leumi B. LLC. • Richmond American Homes has purchased a third land parcel at Cadence, Henderson’s newest planned community. The added parcel encompasses 23 acres and 131 additional lots for the builder. Including this parcel, Richmond American Homes will build 352 homes on 57 acres at Cadence. The homes start in the mid $200,000 with 13 floor plans, including single story homes, starting at 1,700 square feet. • ABC Land and Development Inc. purchased 9.55 acres at the southeast corner of Buffalo Drive and Sunset Road for $4.25 million. Scott Gragson and Robert Torres of Colliers International represented the seller, Beltway 4.77 LLC. • JJS LLC sold a 7,150-square-foot industrial building on 1.17 acres at 4280 N. Pecos Road in North Las Vegas. Eric Larkin of NAI Vegas represented the seller in the $705,000 transaction. • Jones Signs Inc. leased 7,785 square feet of industrial space at 5860 La Costa Canyon Court. Eric Larkin of NAI Vegas represented the lessor, Clifford Douglas Trust; Dean Willmore of Colliers International represented the lessee. • Payne & Fears LLP leased 4,093 square feet of office property in City Center West at 7251 W. Lake Mead Blvd. Taber Thill, Ryan Martin and Patti Dillon of Colliers International represented the lessee. • Michael Kors Retail Inc. leased 2,631 square feet of industrial space in Eldorado Business Center at 7465 Dean Martin Drive, Suite 103. Dean Willmore of Colliers International represented the lessor, TLF Logistics II Eldorado Business Center. • Vital Communications Inc. leased 4,024 square feet of industrial space in the Patrick Commerce Center at 6151 McLeod Drive. Dan Doherty, Spencer Pinter, Susan Borst, Chris Lane, and Jerry Doty of Colliers International represented the lessor, BKM Patrick 102 LLC. • House Advantage leased 10,774 square feet of office space at Hughes Center West in Summerlin. Eric Larkin of NAI Vegas represented the tenant. • 4-Wheel Parts leased 18,645 square feet of industrial space at 3901 W. Russell Road. Eric Larkin of NAI Vegas represented the tenant.